There is no better time than right now to upgrade your commercial laundry facility with card operated laundry equipment. You have probably been thinking about it for a while but didn't think you were ready financially. That is not a problem with Commercial Laundries Orlando card op washers and dryers. We have affordable machines at competitive pricing and also budget friendly lease options for you to choose from. You can upgrade now and enjoy all the benefits of card operated laundry machines. Our Orlando card op washers and dryers will not only upgrade your commercial laundry facility, but also increase the value of your property. 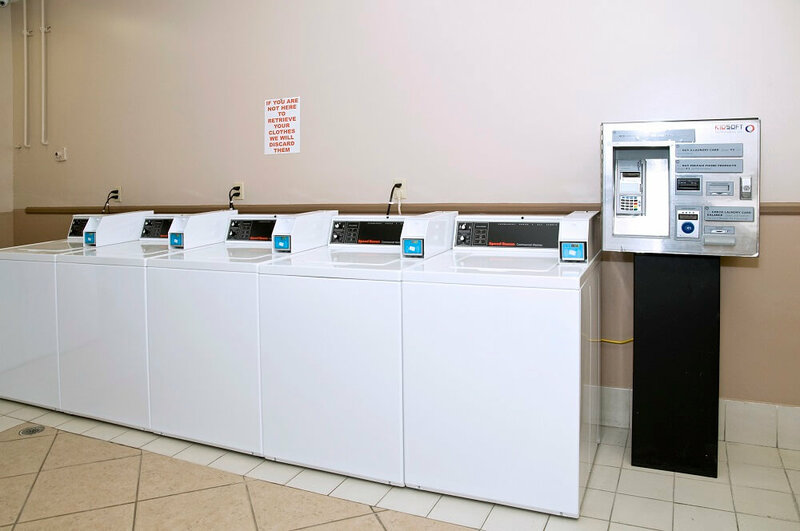 An attractive and technically advanced laundry facility amenity will help to attract new tenants and also retain existing ones. Your tenants will appreciate the appeal and convenience of using card op equipment and will love the performance of our quality machines. Each time a tenant uses his card it will automatically be debited for the cost of the laundry service and the data will be stored where you can easily access it for bookkeeping purposes. When a tenant wants to add more credit to their card they can use cash, or a debit/credit card, at the CleanPay Kiosk located in your laundry facility. When you buy card op laundry equipment your tenants will no longer have to collect coins for laundry day. They can easily slide their handy card through the scanner on the machine and it is engaged for use. Another one of the many benefits of card operated laundry machines is that you will be able to increase your prices in small increments. You can customize pricing schedules for days of the week, perhaps upping prices for peak traffic days and lowering prices on slow days. You will no longer have to go about emptying each coin vault to collect your money, and you won't have to worry about coin vault tampering or theft. We carry top tier, card op laundry equipment built by world famous companies like Maytag, Whirlpool and Speed Queen. These manufactures use metal components in their machine construction to provide you with durable, heavy duty equipment that can withstand the rigors of constant daily use. You can lease or buy card op laundry equipment in front and top loading models and we also carry space saving stackable equipment for small spaces. All of our machines are Energy Star certified to provide you with machines that require less electric, water, and gas to operate. If you are working with a tight budget at the moment you can lease card operated washers and dryers in Orlando from us. All of our leasing clients receive complimentary maintenance visits and repair services on all leased Orlando card op washers and dryers, for the lifetime of the lease contract. One of our technicians will visit your facility on a regular basis to maintain your leased equipment and keep it working at its peak performance level to ensure an excellent laundry outcome and cost-effective savings. If one of your machines needs repairs, your technician will attend to the matter quickly and efficiently. We employ our own team of licensed, insured and educated mechanics and technicians who are required to continue their education to stay abreast of the rapidly evolving technology of our industry. Our team is educated, experienced and capable of handling any laundry equipment problem you may have. We also maintain a 15,000 square foot warehouse stocked with commercial laundry equipment and parts so that we have the resources available to meet all of your laundry equipment needs. When you partner with us you gain a dedicated team of professionals who are committed to assisting you in operating a successful laundry business. To learn more about the benefits of card operated laundry machines contact Commercial Laundries Orlando today at 407-986-1410. TO LEARN MORE, CALL 407-986-1410 TODAY!